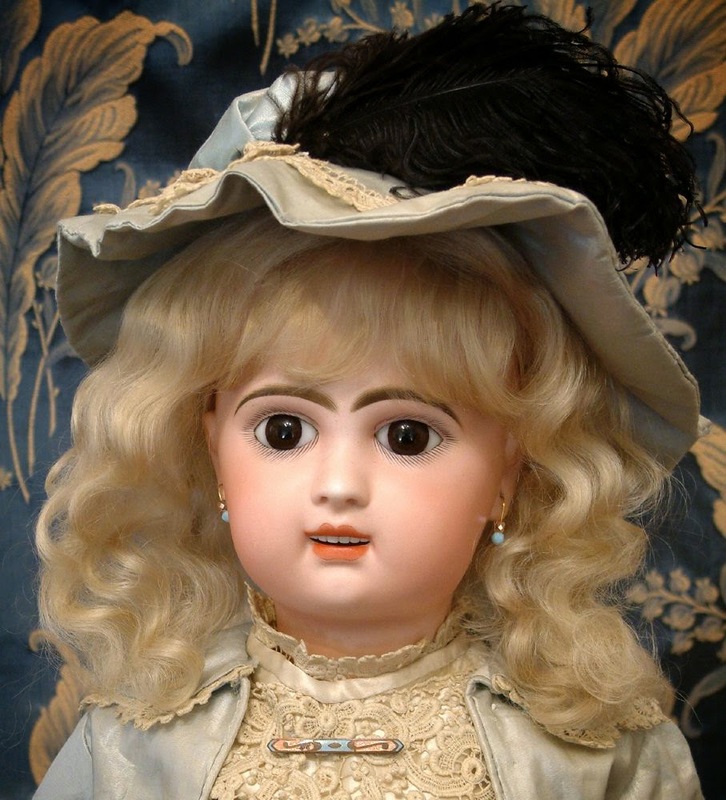 Jumeau is a name familiar to doll collectors the I world over and it's a brand that spells quality. J Pierre Francois Jumeau became known as the 'King of the Dolls' from 1862 on wards, renowned for his dolls' stunning ensembles and his ingenuity of ideas. 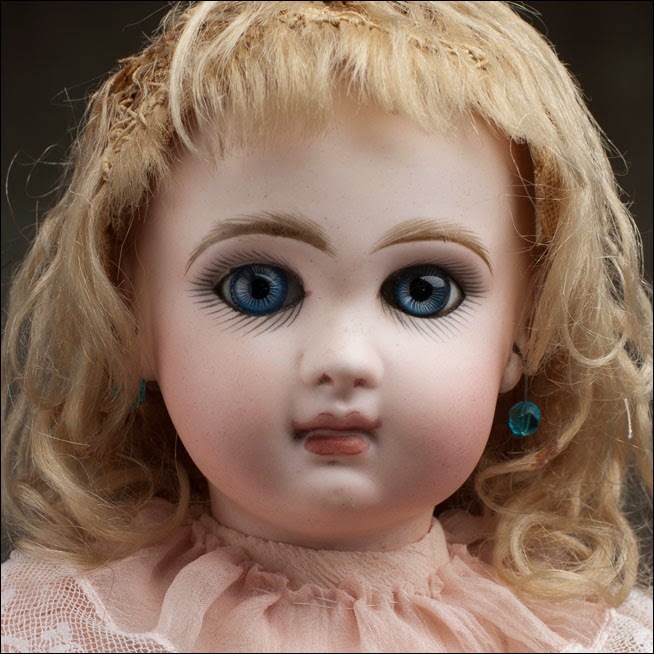 Jumeau became particularly famous for his doll's large, expressive eyes fringed with heavy lashes, apparently described with some alarm in advertisements at the time as 'human'. The elaborate wigs, made of very fine human hair or from Tibetan goat, were equally spectacular and these were elegantly curled on wooden curling pins, wrapped in paper and then boiled. Famous too were the clothes, socks and shoes the Jumeau dolls wore. In the factory's colourful sewing room, walls were covered with dress patterns and fresh ideas for new outfits. Madame Jumeau made herself personally responsible for the selection of dresses and designs - which arrived in vast quantities from out of work seamstresses and milliners who had served apprenticeships with famous dressmakers. The most glamorous outfit ever made was a fur coat of Mongolian lamb with matching hat and muff, worth hundreds of pounds. Extra dresses, socks, shoes and underclothes, or a complete trousseau supplied in a small suitcase, were also sold separately if required to complete a doll's wardrobe. These now fetch high prices at auction. At a Christie's sale late in 2014 a silk dress 14" (35.5 cm) long with a 5.1/4" (13 cm) chest went for £380 and another similarly sized, in wool, sold for £450. Jumeau shoes, in absolutely any condition, are also very collectable - but look for the trademark bee cold-stamped onto the soles to confirm authenticity. In the same sale at Christie's, four pairs of Jumeau shoes, one pair of which were considerably worn, almost doubled the estimated price and sold for £564. 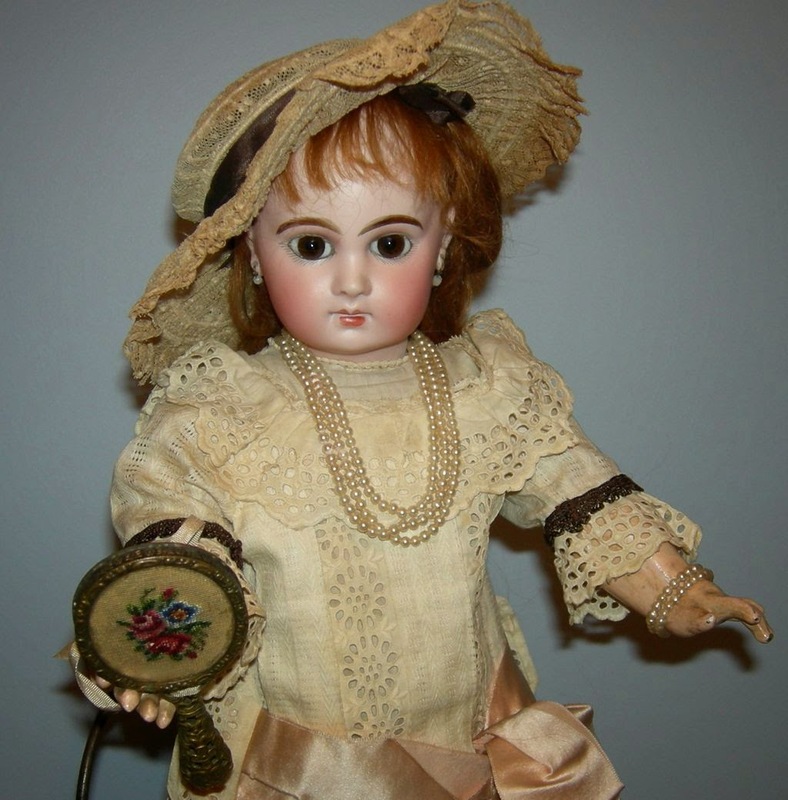 Every doll despatched from the Juraeau factory at Montreuil was sent out in a stout cardboard box which read: "Bebe Jumeau, Diplome d'Honneur, Medaille d'Or 1878" - and collectors are reminded that any Jumeau doll in its original box, whatever the condition, will send the price rocketing. A further example of aggressive advertising occurred when the Empire fell in the Franco-Prussian War in 1870-1. With intense dislike between France and Germany at the time, Jumeau enclosed a booklet in his dolls' packaging, allegedly to be written by the doll to its new owner, scoffing at the ugly German dolls with their stupid faces, their goggle eyes and poor bodies! Apart from his successful business acumen and the excellent dolls he made, Jumeau was also recognised as a philanthropist and in 1886 was made Chevalier de la Legion d'Honneur for service to his country. He made a practice of employing people who were down on their luck - such as the unemployed seamstresses whom Madame Jumeau engaged for making the dolls' clothes. Many orphan girls were also offered apprenticeships at the factory and throughout their time with the company Jumeau kept them in food and clothing. The girls making the famous Jumeau eyes, which required great skill, were particularly respected and served a five-year apprenticeship. The process was long and tedious. Girls sat before strong gas jets, in order to melt the glass rods. In one hand they held a glass maker's rod, about 10" (25 cm) long, and in the other a rod of black glass which, by turning on the end of the tube, made the pupil. Glass of the required colour on a stick was then melted in a circle around this to form the iris and the process by which the eye came to life so realistically was to make small lines in the iris with a very fine piece of white glass... referred to by collectors as yeux fibres. Then, to give added brilliance, clear crystal would be heated and dropped over the eye. 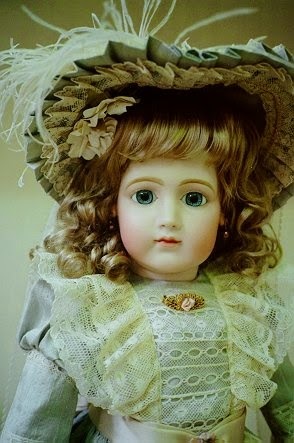 Towards the end of the 19th century the search was always on for more life-like dolls and patents flooded in for improvements - such as the movement of eyes and the assembling and durability of the doll, especially for the larger ones. Bodies for the Jumeau dolls were originally made in kid on a wire foundation. The larger the doll, the more layers would be placed in the moulds - when dried and the two halves glued together, this process resulted in a remarkably strong body for the doll. Jumeau also made black dolls with bisque faces tinted brown, and introduced dolls with smiling mouths, either open with teeth showing or closed. In 1897 further innovations brought about the sleeping eyes worked by a lead weight and another eye movement known to collectors as 'glancing' or 'flirting eyes', where the eyes moved from side to side. Towards the end of the 19th century, when automata was at the height of its popularity, Jumeau became the main supplier of bisque heads to the famous Parisian automata makers. In a Christie's sale this year, Jumeau dolls were still in the top price bracket. All of them were priced up in the thousands and many doubled their estimates. At an exhibition in Paris in 1889, these dolls were described as "beautiful, intelligent and French-looking". Their hats and dresses of pure Lyons silk were also praised. In 1840, when the company was founded, Jumeau justifiably shouted about his fine dolls and used clever advertising to sell them. They are still dolls that "preserve the cachet of elegance and good taste"- and over 160 years later these dolls remain in the top league.